Here’s the thing though. I don’t know if Chloe actually said much more than that at 17 months. Just because we can’t get her to stop talking for more than 5 seconds these days doesn’t mean she was talking at 17 months. But dealing with 2 kids means I have less patience to try to figure out what Devon is trying to say. And having an older sister means that someone else is often talking for him or over him. 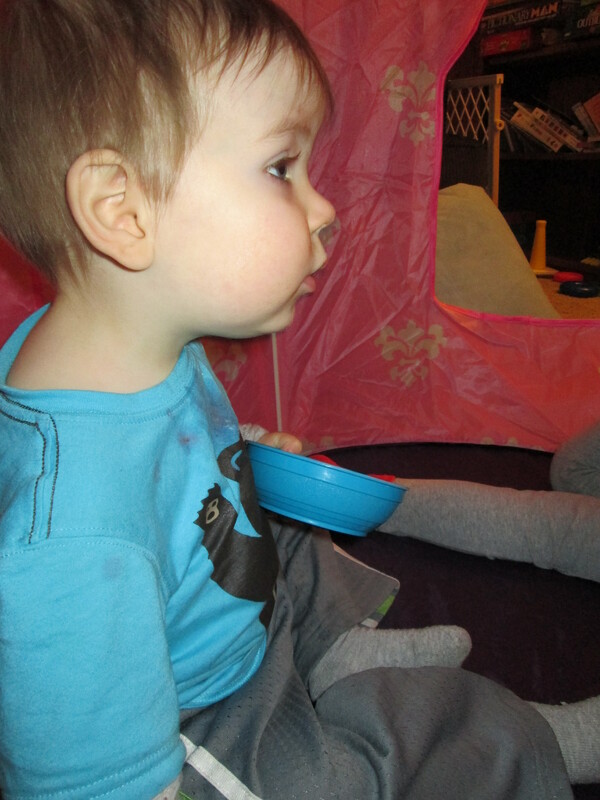 I’m sure he’ll talk eventually – most kids don’t go into kindergarten grunting, right? And when you have these adorable, chubby cheeks, why would you need to talk? My husband can cook. I mean, he can really cook. He made us homemade Egg McMuffins for breakfast. By lunch, I thought maybe I should document the day’s food. 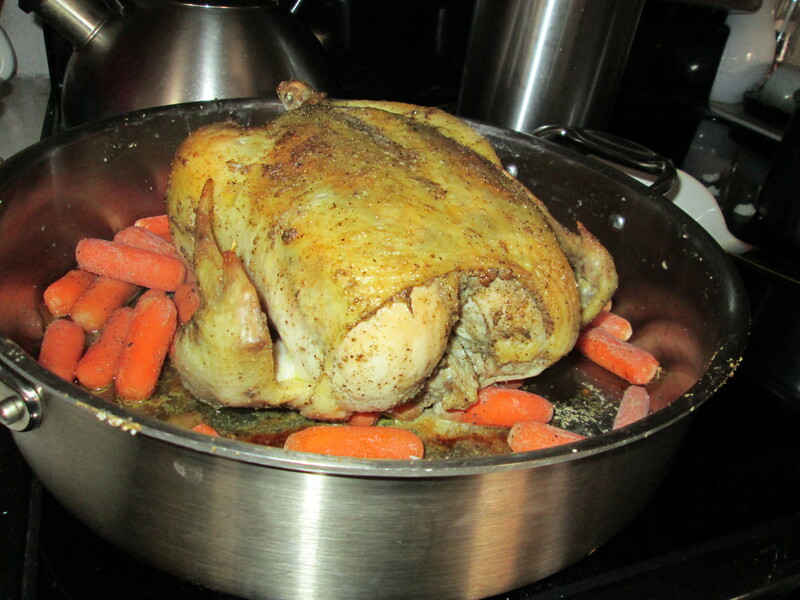 Our lunch was baked chicken, mashed potatoes and carrots. Dinner was homemade pasta with shrimp, scallops, crab and broccoli in a white sauce along with homemade cream cheese biscuits. Not only did Aaron make all this food, he patiently allowed Chloe Mae to help him make it all. For dessert, Aaron and Chloe made a chocolate cheesecake with an Oreo crust and chocolate ganache on top. How cute is our boy?!? I’d love to say that all our time is like this, but we’ve entered the tantrum phase. Usually, distraction is a good technique to end the tantrums at this point. However, there have been 5 tantrums in the last 48 hours that we’ve had trouble ending without just giving in. What’s the problem you ask? The 5 tantrums were for one of two reasons: 1) He wanted to take a bath and we wouldn’t let him, because we’d already done a bath earlier in the day or were busy with another activity. 2) He wanted hot tea. It’s becoming ridiculous how much he loves hot tea. I can’t help thinking that we have a strange, strange kid. And while that’s probably true, I can also say that we sure do have an adorable, unique boy! That’s right people. Chloe Mae let her Little Bud-Bud sleep with her coveted Curious George last night. We had asked Chloe to get Devon’s taggie blanket from her room when he was upset about something. She came back with his taggie and her George. He loved snuggling George and was still snuggling when it was time for bed, so she offered to let him sleep with George. Then our boy who normally wakes up around 5:30 or 6, slept until 7AM. Coincidence? I don’t know. I guess we’ll test it out tomorrow morning since she let him sleep with George again. Either way, I love the sweet way my kiddos love each other!